Cancer has taken many loved ones away from us. 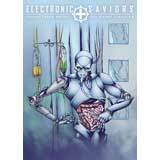 Metropolis Records, in association with Distortion Productions presents Various Artists  Electronic Saviors: Industrial Music To Cure Cancer, a five disc boxset of exclusive tracks by some of the biggest names in the industrial genre to raise money for cancer research. Cancer survivor and long time promoter and DJ, Jim Semonik has assembled 83 artsits from around the world. The boxset includes 4 cds and a downloadable 5th disc when you purchase the physical edition.